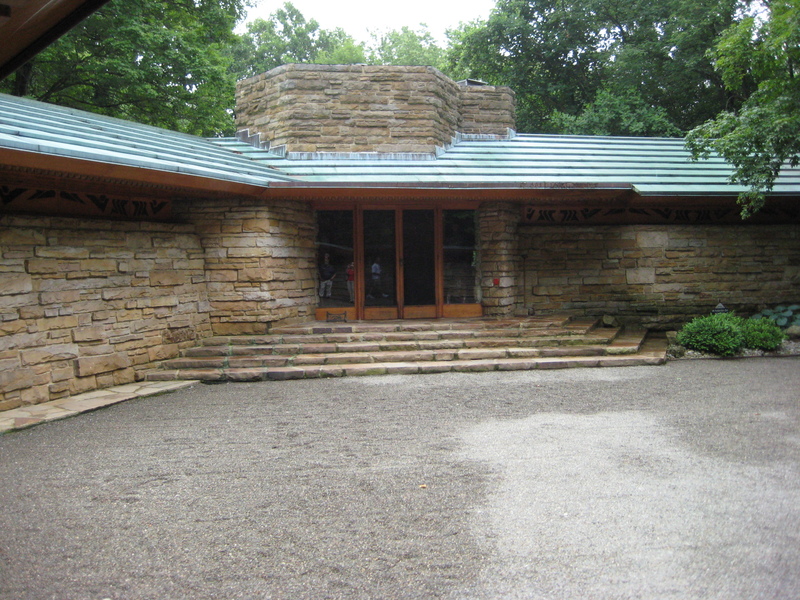 On Saturday, I was able to check a couple significant things off my list of stuff to see — along with my parents, we toured Fallingwater and Kentuck Knob, the two Frank Lloyd Wright houses in the mountains east of Pittsburgh. 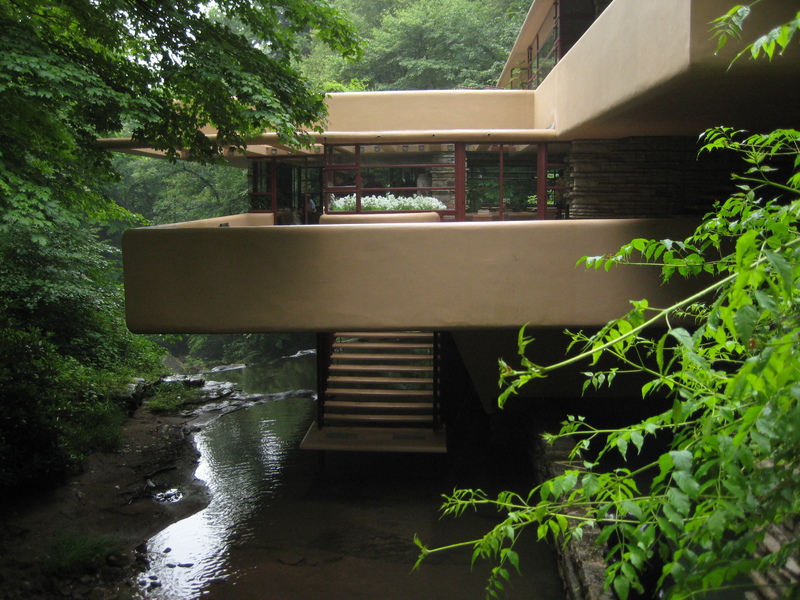 Wright built a stairway to a small deck at the creek, so the Kaufmanns could be that much closer to the spot they chose for the home. You can hear the waterfall in every room of the house. Fallingwater was first, and I may be the only one in our group who felt fortunate to be in the house while a thunderstorm rolled by. Our guide explained that FLW tried to blur the barriers between the structure and the cliffs, forest and water that surrounds it. With the rain falling as we looked out the corner bedrooms on the second and third floors, that line disintigrated further. I’ve never been in a structure that would have put its residents so close to their surroundings; turn nearly any corner and you’re faced with a wall of windows or a doorway to one of the terraces that jut out over the gorge. The entrance to Kentuck Knob. The orange tile to the right of the door is Wright's signature, a practice he started late in his career. Our guide said he didn't leave a similar signature at Fallingwater. As beautiful as Fallingwater is, I might have liked Kentuck Knob better, at least in once sense — I have an easier time imagining that I could live there. The proportions are more traditional, thanks to the occasional insistence of the Hagans, the Uniontown family that commissioned the home, that some of the original plans be altered to better suit their needs. 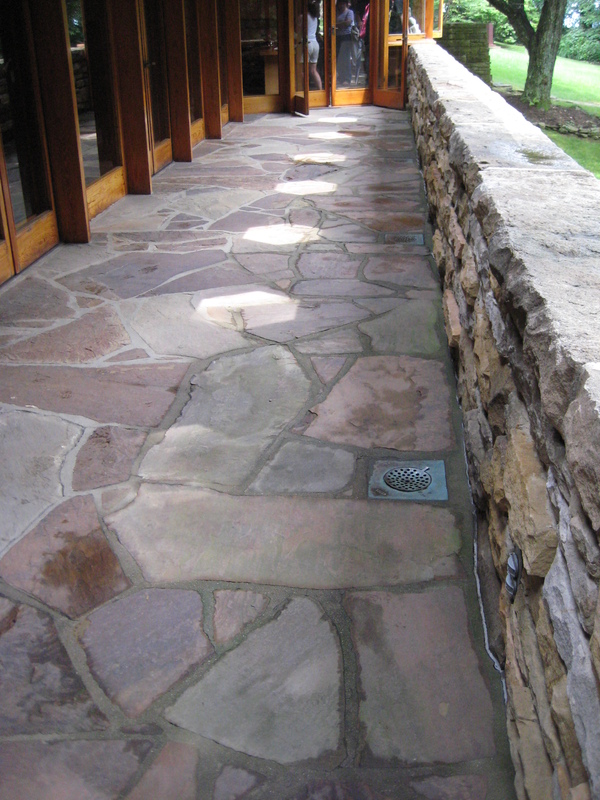 The design of Kentuck Knob is based on hexagons and triangles, and they are everywhere. This is a drain spout in the carport there. Guides in both homes referred to Wright’s practice of “client-proofing” his structures, or building them in a manner that they could not be easily altered down the road. And although he acquiesced to several of the changes the Hagans requested, he was notoriously cranky about doing so. 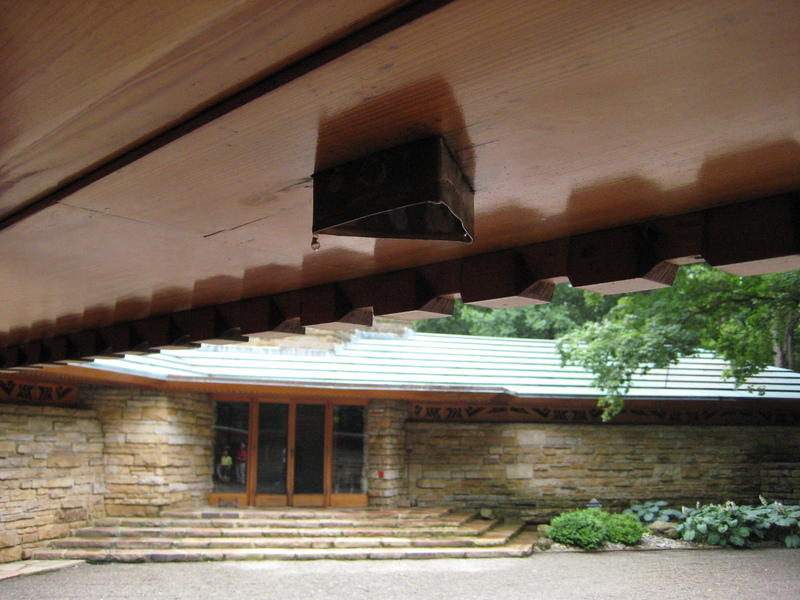 More hexagons at Kentuck Knob, this time in the form of skylights along the rear porch. 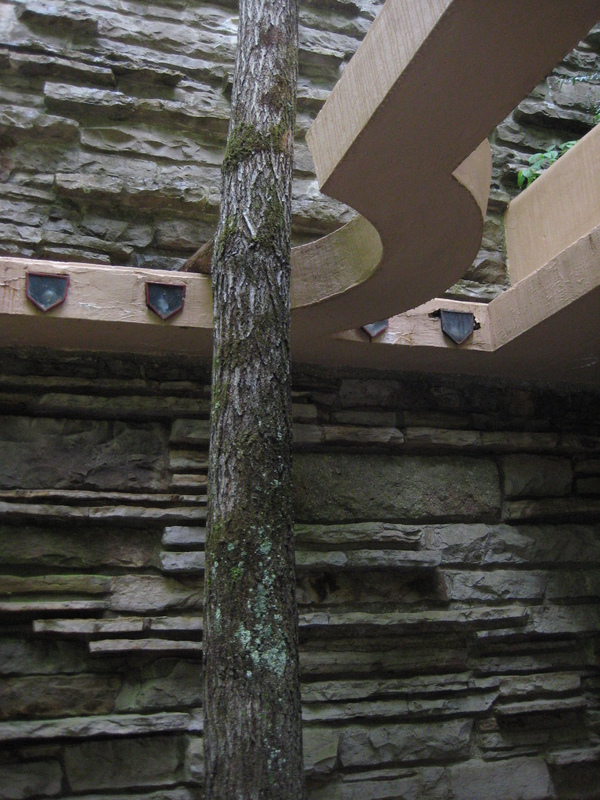 He was equally notorious about underestimating the cost of his projects; according to our Kentuck Knob guide, the Kaufmanns, for whom Fallingwater was built, advised the Hagans to tell Wright they were willing to spend about half of what they could actually afford when they asked him to build the house. Both homes are worth the trip, and the money you’re asked to pay to see them. Both are breathtaking, and if you haven’t seen them already, you should go. The trip also generated two grumbles; neither were a big enough deal to spoil the day, but both, I think, are significant enough to address. 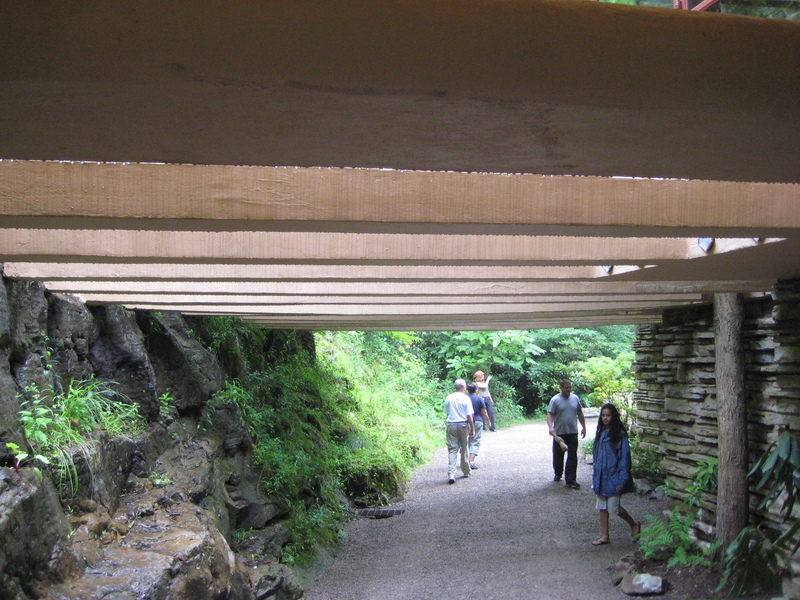 Fallingwater carport. The last stop on the Fallingwater tour is the former guest house carport, which has been enclosed and fitted with Wright-style sofas that patrons are encouraged to sit on. There’s also a large television in the room and a staff member who greets you and chats a little bit while everyone gets settled. What I expected: A final chance to ask questions about the property and maybe a short video about the home’s recent restoration or other ongoing projects. 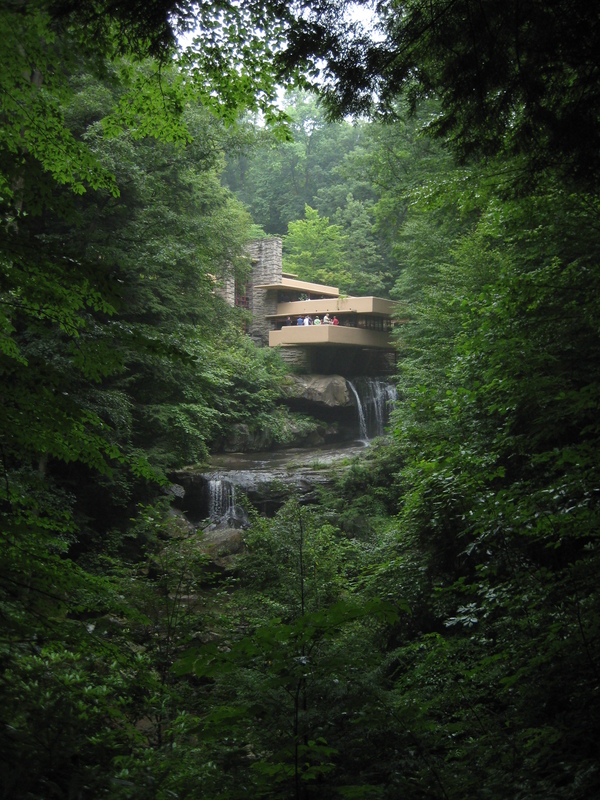 What we got: A 10-minute commercial for the Western Pennsylvania Conservancy — the group that owns Fallingwater — including a pretty heavy-handed pitch to leave some money in a donation box at the front of the room. I understand that the conservancy is a non-profit. I realize that the upkeep of that property must come at an astronomical cost. And while I’m familiar with the conservancy and what it does because I live here, I know that many visitors won’t have the same knowledge. So take 60 seconds and explain that the conservancy is a non-profit and that donations would be appreciated. Have someone available to answer questions about the conservancy and its mission. But when you force patrons to sit though that pitch at the end of the tour, you risk turning happy customers into grumpy people. I know we weren’t the only ones griping. 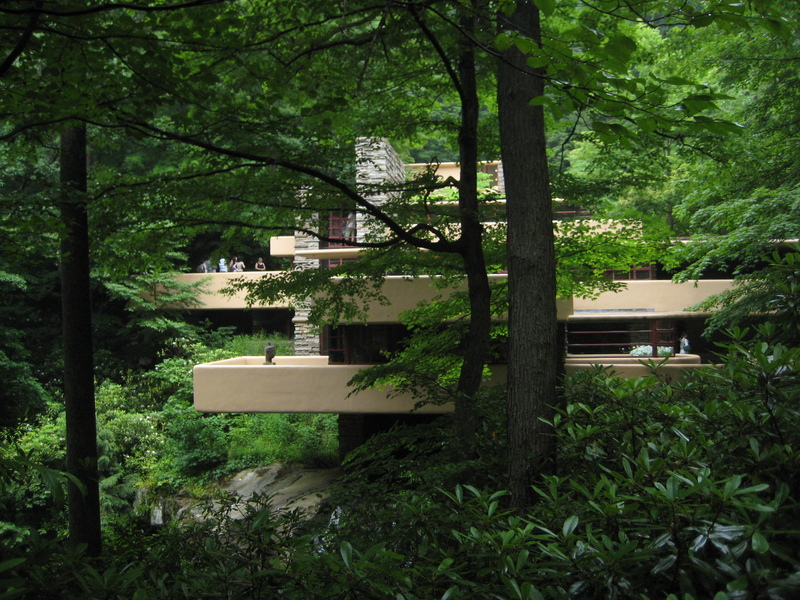 Through purchase of an admission ticket to Fallingwater, visitors agree that photographs, paintings and sketches of Fallingwater are not to be offered for sale or exploited for any commercial purpose or in any way made available for any third-party use. All photographs, paintings and sketches generated during your visit are for personal use only, and cannot be sold, published or posted on a website without permission of the Western Pennsylvania Conservancy. Original works may be exhibited, but reproductions or prints may not be produced. This includes, but is not limited to all photographs, paintings, sketches and drawings generated during your visit. OK. The non-commercial part is fine; that, in fact, is perfectly in-line with the Creative Commons license I’ve chosen for this site. But, I still have questions for the folks at Fallingwater. You tell me my photographs cannot be displayed on a website. You tell me they can be exhibited. What if I choose to exhibit them here? Does that constitute a violation of your policy? Hm. I guess we’ll find out. Be sure you check for FLW work when you visit any city. They never disappoint. Fallingwater is special. Like memories of some place I used to live. I think they should let you show pictures if you or people you know are seen in the picture. Assuming you’re not, like, the swedish bikini team or something. I was just thinking that I should add Fallingwater to the list of things to do when the in-laws visit, but the no photography rule sort of ruins the whole idea for me. I know I should be content to see something amazing in person, but right now I’m all about photography. Maybe we’ll have to go somewhere else so that I can enjoy myself while entertaining the guests. 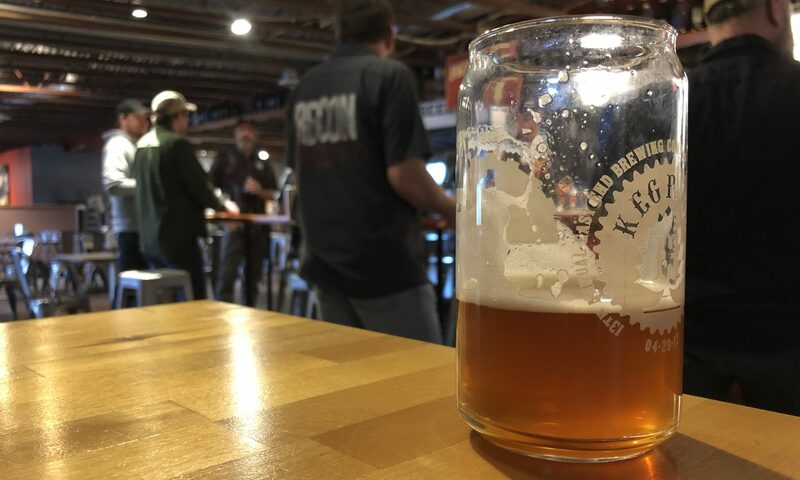 BB: You should go. There are still plenty of opportunities to shoot cool stuff outside both houses, and once your tour is over, you’re pretty much free to wander around as much as you want. One thing to remember: get a reservation first. When we left, in the early afternoon, there was already a two-hour wait for walk-ups. As for enforcement of their photo policy? Search Flickr. 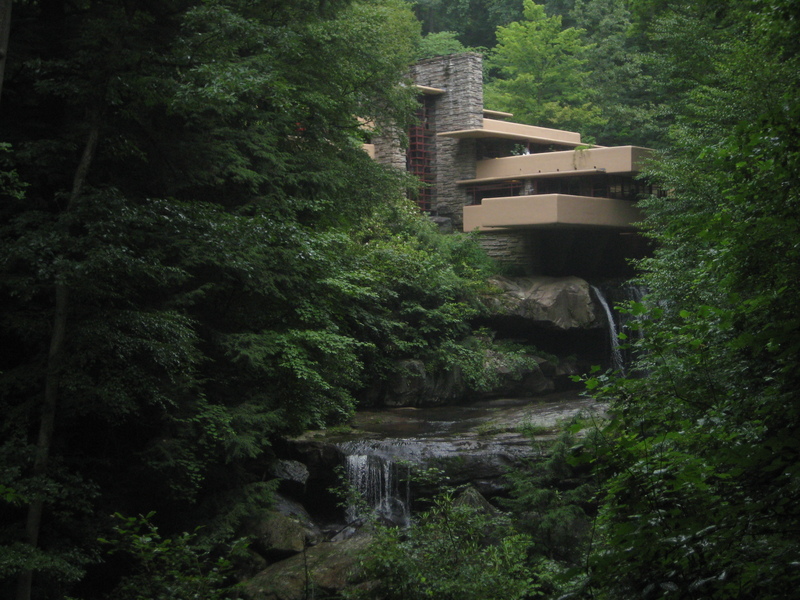 Eighteen-thousand-plus hits for “Fallingwater.” I’m not especially concerned. We were happy to have you visit Kentuck Knob and delighted to hear you enjoyed your visit. Heidi: Thank you, both for commenting here and for doing a tremendous job at Kentuck Knob. Both houses are spectacular, and we’re lucky to have them both close by. And: autumn is my favorite time of the year, and I would love to come back in October to have another look. Next PostNext can’t blame them.